The second edition of Getting Results Without Authority is now available from our secure online shop. 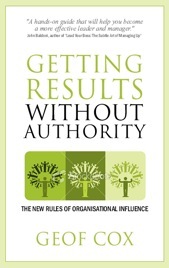 This book, written by Geof Cox, is about working in modern organisation structures where you don't have the authority or power to tell people what to do - or if you do have it, they don't respond positively. Buy the SECOND EDITION from the online shop. Getting Results Without Authority is a hands-on guide packed with techniques, approaches and exercises to help managers find new and better ways of getting things done, on time and on budget. The main focus of the book is to help you to develop approaches where you will get what you want whilst simultaneously building, or at least maintaining, a positive working environment. This will enable you to achieve short term goals without sacrificing future good will.